All photographers seek to capture that "perfect moment" and anchor it in time so that it can be shared and cherished over time. A really good photo tells a story when words just aren't enough and strives to explain the world at a moment in time when passion, joy, and yes, challenges, are communicated. It's as if the photographer has tiptoed right into the subject's reality and revealed the truth of the moment. Andrea Watson has been taking sailing photos for the past 15 years. She is a sailor and knows the exact spot to capture the frenzied jogging for advantage on a crowded starting line, the hair-raising close action at a windward mark, those "oops! moments" when that spinnaker set was less than optimal (read: really disastrous), and the determination of skipper and crew as they fight to cross the finish line first. With the help of an extended telephoto lens, she gets right in the thick of the action, sometimes climbing on board with teams, ready to score a photo revealing the heat of the moment. It is her passion for the sport of sailing, her compassion, and yes, her unabashed excitement to be on the water that is reflected in all her photos. The spectacular photographer, Annie Leibovitz has said, "A thing that you see in my picture is that I was not afraid to fall in love with these people." Andrea's passion for sailing makes is easy to fall in love with her sailors, both young and old and makes taking photos of them so much fun. Click on PHOTOGRAPHY above to view and purchase photos. In addition to still photography, Andrea Watson became an FAA Certified Drone Pilot in August 2017, which means she is certified to fly her drones commercially. Andrea is a member of the Academy of Model Aeronautics, the Hempstead Harbor Aero Modelers Society and has four drones, a DJI Phantom 4 PRO, and Spark, both of which are registered with the FAA for Small UAS Unmanned Aircraft System. Andrea recently purchased some DJI Tello drones, with the capacity to control flight with coding. Click on DRONES to read about Andrea's journey in this new Sailing Press service. In addition to the above, Andrea is a noted journalist who has been writing a weekly sailing column, On The Bay, for over 15 years. She has been named Press Officer for many regattas, starting with the Knickerbocker Cup, an international match race that has produced many top-level match racers in both the America's Cup and the World Match Racing Tour. She has covered fleet racing, match racing on the local, national and international level. For examples of recent Press Release, click on PUBLIC RELATIONS above. Andrea is uniquely positioned to promote your event with both press releases and photos. NOTE: To DOWNLOAD photos free of charge, please email Andrea Watson, agwatson@sailingpress.com for a password. 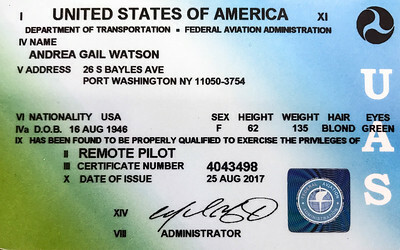 ANDREA WATSON IS AN FAA CERTIFIED REMOTE PILOT! Sailing Press is pleased to announce that Andrea Watson passed the FAA Part 107 Remote Pilot Certificate. After many hours of studying, and with the help of DartDrones, she took the two-hour test at Republic Airport on Aug. 23, 2017. The test was difficult, especially as she had no prior pilot experience. Lots to learn, including aviation weather, airspace, FAA regulations, and those very detailed Aeronautical Charts. She has come away from the whole testing process with a great respect for piloting a drone on Long Island, considering Kennedy and LaGuardia airports and the smaller regional airports are located in the area. See her Remote Pilot Certificate #4043498 on the right. Sailing Press is proud to announce a new service for children and drones. 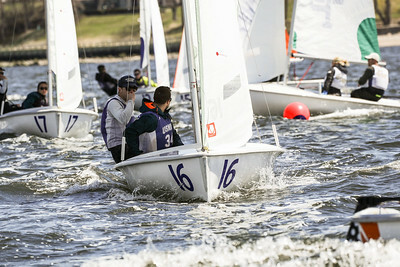 All photos from Kings Point regattas will receive a special discount on all photos taken during regattas. Going forward, all USMMA-related photos will be posted on this site. If interested please email agwatson@sailingpress.com for more information. Until Dec. 31, 2018, Andrea was the Executive Secretary of the Yacht Racing Association of Long Island Sound (YRALIS). For 11 years, in addition to managing the office, she was their press officer and photographer, managing both the YRALIS website and Facebook page. To honor and recognized Andrea’s work at the YRA, the Board of Directors named a new perpetual trophy called THE WATSON. This trophy celebrates the achievements of women racing on Long Island Sound for their sailing accomplishments and their efforts in promoting women’s sailing. By the end of the year, 87 women competed in the inaugural THE WATSON perpetual trophy. Please join me in recognizing and applauding each of these incredible women who made 2018 a banner year for Long Island Sound women sailors. Yours truly feels especially blessed to have had the privilege of getting to know these ladies and be a part of this exciting new chapter in a long history of women making their mark on the sailing community. Kudos to the women racers who are al part of a force that is taking over Long Island Sound. Called Women on the Water, the group represents major LIS yacht clubs and organizations - all female - who have made their mark on women's sailing and continue to change the face of sailing. They recently updated their website. Check it out at https://www.womenonthewaterlis.com. These ladies are AMAZING. They have figured out how to grow sailing on LIS when some fleets are having difficulty keeping their numbers up. Congratulations and many, many thanks to all who raced this year in the 2018 WATSON trophy. The Yacht Racing Association of Long Island Sound introduced a new racing series to promote women’s sailing on Long Island Sound this year. Named to honor the YRALIS past Executive Secretary, Andrea Watson, this series targeted four existing women’s events on Long Island Sound: The Queen’s Cup at American YC held on July 7; the Gillespie Women’s Regatta at Norwalk YC on July 21; the Lorna Whittlesey Women’s Regatta at Indian Harbor YC on Sept. 9; and the Commodore Mendez Trophy at Larchmont YC on Sept. 15. Katie Morgan, Noroton YC, won the series. Her crew over the 4 events: Nicole Casey (Queen’s Cup and Gillespie Trophy), Britt Hall (Lorna Whittelsey), and Natalie Imamura (Commodore Mendez Trophy). Congratulation to Katie and the 78 women racers, representing 13 yacht clubs, who competed in this inaugural year of the Watson Women’s Series. The scoring for the inaugural Watson series was very close in the best 3 out of 4 events. Ginny Worcester and Katie Morgan tied with 2 firsts and 1 second each. When converted to high point percentage, Katie ended up with a .972% vs. Ginny with .970% Can’t get much closer than that. The Queen’s Cup, which is the YRALIS Women's Sailing Championship, led the series. Formerly called the Syce Cup, the first recorded event took place at Indian Harbor YC in 1934-35. It has been held at various yacht clubs on Long Island Sound every year since then, except for 1942-45 and 1992, 1995. 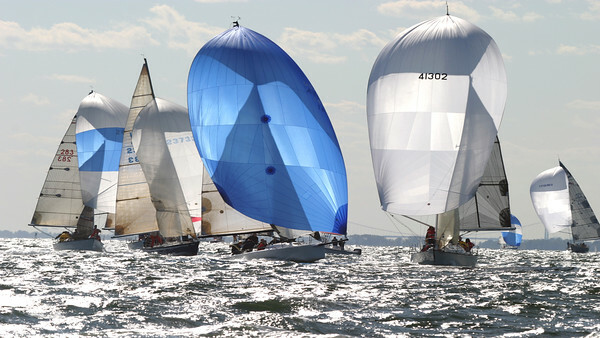 Yacht clubs that have won this event over the years include: American (18), Seawanhaka (14), Indian Harbor (10), Manhasset Bay (7), Riverside (6), Larchmont (4), Noroton (3), Pequot (2), Sea Cliff (1), Rocky Point (1), Knickerbocker (1), Greenhaven (1), Centerport (1), Cedar Point (1), Stamford (1) (1), Black Rock (1). 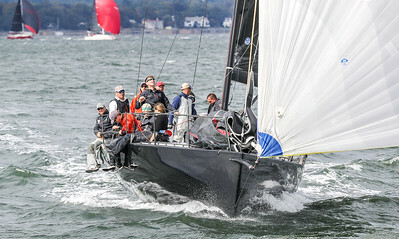 er the year's is a Who's Who in sailing on Long Island Sound. Allegra Knapp Mertz (AYC), Sylvia Shethar Everdell (AYC), Toni Monetti (MBYC), Timothea Larr (SCYC), Betty Foulk (IHYC), Mimi Neff (SYCY), Pat Hinman (MBYC), Mary Savage (LYC), Sue Miller (MBYC), Anne Mooney (SCYC), Carolyn Fisher (IHYC), Nancy Foote (PYC), Sally Sawyer (RYC), Clemmie Everett (AYC), Ginny Worcester (Norwalk YC/Black Rock YC). For a complete listing, check out the page listing the Queen's Cup in the 2019 YRALIS Racing Book. Ginny Worcester and Anne Munkenbeck, Black Rock YC/Norwalk YC; Katie Morgan and Nicole Casey, Noroton YC; Cynny Smith & Karen Martinez, Riverside YC; Clemmie Everett and Fiona Walsh, American YC; Alix Hahn & Carolyn Russell, American YC; Pamela Washington and Anne Stark Locher, Larchmont YC; Karin Nye and Karen Lau, Indian Harbor YC; Paula Schaefer and Hilary Davidson, American YC; Alison Buchanan and Angela Nesbitt, Larchmont YC; Barbara Bellafiore & Tamara Upham, Riverside YC; Tracy McRoberts and Mary Selover, Seawanhaka YC. Event Chairs: Paula Schaefer and Sue Hull. Top 3 teams: 1. Ginny Worcester and Anne Munkenbeck, Black Rock YC/Norwalk YC; 2. Katie Morgan and Nicole Casey, Noroton YC; 3. Cynny Smith & Karen Martinez, Riverside YC. Event Chairs: Paula Schaefer and Sue Hull. The teams: Kate Morgan/Nicole Casey, Noroton YC, Ginny Worcester/Anne Munkenbeck, Black Rock YC and Norwalk YC, Teresa Laughlin/Pam Washington, Larchmont YC, Paula Schaefer/Lisi Dunlap, American YC; Cheryl Lewy/Karin Sherman, Larchmont YC; Barbara Bellofiore/Muffy Fox, Riverside YC; and Marta Noriega/Maria Tabasched, Noroton YC. Top boats: 1. Kate Morgan/Nicole Casey, Noroton YC, 2. Ginny Worcester/Anne Munkenbeck, Black Rock YC Norwalk YC, 3. Teresa Laughlin/Pam Washington, Larchmont YC. On Saturday, Sept 8, the wind was up and the waves big. 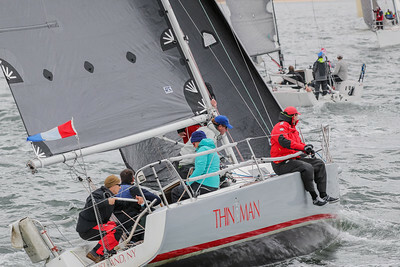 The 15 teams were eager to get out on the Sound and start racing. For the more experienced teams, the weather was a dream come true. No lack of wind for these ladies. For the less experienced teams, racing was a bit more difficult. But not one team opted out. Some decided not to fly a spinnaker, which indicates they really understand their skill level. PRO Roger van Loveren and his Race Committee did an excellent job of getting in six races before heading back to the clubhouse to get ready for the Awards Ceremony. 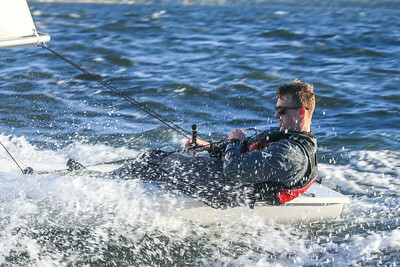 Larchmont Yacht Club hosted the Commodore Mendez regatta, the 4th and last event in Watson Trophy. Paul Lennon, PRO for the day, had his work cut out for him. They delayed the start for lack of wind and then tried to get a few races done before noon. The teams had some difficulty getting to the finish line. But as the day progressed, some wind filled in and gave the teams some relief. While several protests were heard (none affected the top three positions), the ladies had time to eat, drink and talk about the race. Even with so little wind, the ladies were upbeat and smiling.